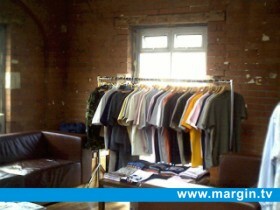 Showcasing upscale streetwear, the second edition of MARGIN LONDON has grown in size and scope. The February 2003 edition will preview clothing and accessories ranges for Men and Women by 35 unique labels, including many new design start-ups. 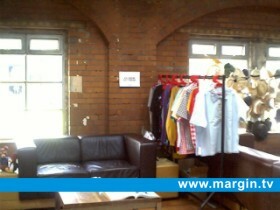 The new MARGIN LONDON venue, located close to Oxford Street & Bond Street, provides a relaxed space to view collections. 1 minutes walk from Bond Street Tube Station. February 9th & 10th 2003, between 10am to 6pm. 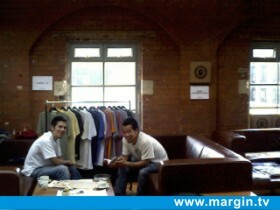 The first edition of MARGIN LONDON took place in August 2002. 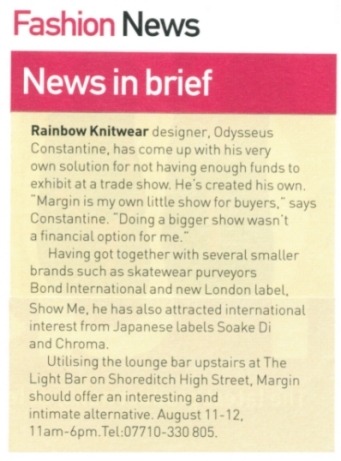 The venue was the relaxed and comfortable Light Bar in E1. Buyers from key stores and buying groups in France, Ireland, Italy, Japan, and the UK attended over two days to preview Spring/Summer 2003 collections from British and Japanese labels. Key Stores from Japan such as Beams, United Arrows and Isetan attended alongside respected British independent stores including Hip in Leeds, Sakis in Sheffield, The Pineal Eye and Buddhahood (B Store) in London, and Brown Thomas in Dublin. The next edition will take place in February (dates & venue to be confirmed). available in kits to make them yourself. All kits come with full instructions, needle, threads, cloth, and a cute square keyring to put the stitching in when you’ve finished. 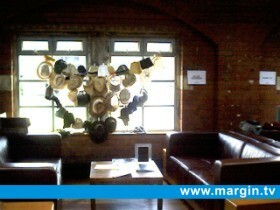 Pieces by Sewkits were on display at Margin London in August 2002. 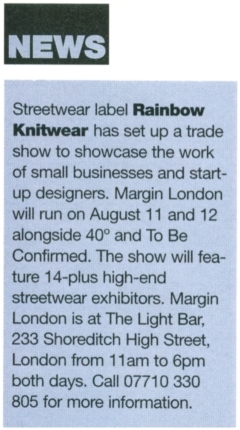 MARGIN is a new event taking place in August for fashion buyers and press to preview forthcoming collections. 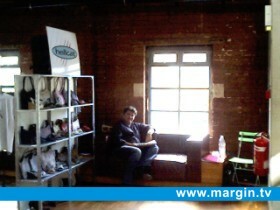 A small-scale satellite show, MARGIN provides an alternative platform for exhibiting labels. Located in The Lounge area on the top floor. Dates: August 11th & 12th 2002.